Brigadier General Clayton M. Isaacson was commander of the 23rd Air Division (Air Defense Command) with headquarters at Duluth International Airport, Minnesota. Additionally, he was deputy commander of the 23rd North American Air Defense/Continental Air Defense Region with headquarters at Duluth. 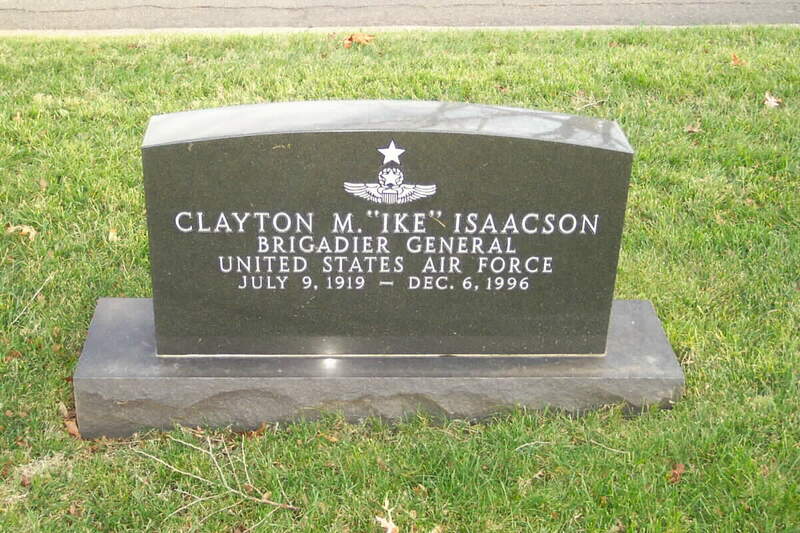 General Isaacson was born at Detroit Lakes, Minnesota, in 1919, and graduated from the Northwest School of Agriculture, Crookston, Minnesota, in 1938. After attending Washington State University for three semesters, he enlisted in the U.S. Army in April 1941. He entered flying school and upon graduation at Ellington Field, Texas, in August 1942, received his pilot wings and commission as Second Lieutenant. He was assigned to the 321st Light Bombardment Group and went to the North African Theater of Operations, where he flew 50 combat missions in B-25 aircraft. He then became a flight commander and later squadron commander in the 82nd Fighter Group, and flew 78 combat missions and was credited with destroying five enemy aircraft in aerial combat qualifying him as an ace. In January 1945 he was transferred to the Southwest Pacific, where he logged another 82 combat missions in P-38 aircraft. General Isaacson returned to the United States in November 1945 for duty as a squadron commander at McChord Field, Wash., and in August 1947 he moved to March Air Force Base, California, as operations officer for the 1st Fighter Group. During the Korean War in July 1950, he was sent to Korea as operations officer for the 51st Fighter Group. In May 1951 he became tactical inspector, Fifth Air Force and remained there until September 1951, flying 123 combat missions in F-80, F-84, F-86, F-9F, F-4U5, F-51 and Australian Meteor aircraft. Upon his return from Korea, General Isaacson assumed command of the U.S. Air Force Fighter Weapons School at Nellis Air Force Base, Nevada. In April 1953 he went to Laughlin Air Force Base, Texas, where he commanded a fighter training group. In November 1953 he became operations officer of the F-86D All Weather Fighter Training Group at Perrin Air Force Base, Texas. In August 1954 he was transferred to Taiwan as Advisor to the Chinese Nationalist Air Force 1st Fighter Group at Tainan Air Base, where he remained until August 1956. His next assignment was as senior Air Force adviser to the Minnesota, North Dakota and South Dakota Air National Guard with headquarters at St. Paul, Minnesota, until July 1959. During this period he also completed his degree requirements for a bachelor of arts degree in international relations at Syracuse. In July 1959 he moved to Glasgow Air Force Base, Mont., to command the 476th Fighter Group. In April 1960 he was assigned to Hamilton Air Force Base, California, as deputy for operations of the Western Air Defense Force and later the 28th Air Division. He went to Addis Ababa, Ethiopia, in June 1962 as chief of the Air Force section, Military Assistance Advisory Group. In July 1964, he was transferred to duty as chief, Special Plans Division, U.S. Strike Command, MacDill Air Force Base, Florida. From November 1964 to March 1965, General Isaacson headed Joint Task Force Leo in the Republic of the Congo. During this tour he flew 10 aerial missions in rescuing hostages from rebel forces and received the Legion of Merit for outstanding service to the United States. From the Congo he returned to MacDill as chief, General Plans Division and later deputy director of plans for Strike Command. General Isaacson assumed command of the 401st Tactical Fighter Wing at Torrejon Air Base, Spain, in May 1966. He was appointed assistant chief of staff for plans and operations, Headquarters U.S. Air Forces in Europe, in June 1967 and served in that position until his return to the United States in June 1968. He commanded the 35th Air Division, NORAD, at Hancock Field, New York, from July 1968 until reassignment in May 1969 to First Air Force at Stewart Air Force Base, New York, as vice commander. General Isaacson was assigned as commander, 23rd Air Division (ADC) with headquarters at Duluth International Airport, Minnesota, with additional duties as commander, 23rd North American Air Defense/Continental Air Defense Region with headquarters at Duluth. His military decorations include the Silver Star, Legion of Merit, Distinguished Flying Cross with two oak leaf clusters, Bronze Star Medal with oak leaf cluster, Air Medal with 31 oak leaf clusters, Joint Service Commendation Medal, Air Force Commendation Medal with oak leaf cluster, Croix de Guerre with Palm (France), Order of Leopold II (Belgium) and Order of Aviation Merit (Spain). A command pilot with 8,000 flying hours, he is also a graduate of the U.S. Army Jump School, Fort Benning, Georgia. He was promoted to the temporary grade of Brigadier General August 1, 1967, with date of rank July 31, 1967. 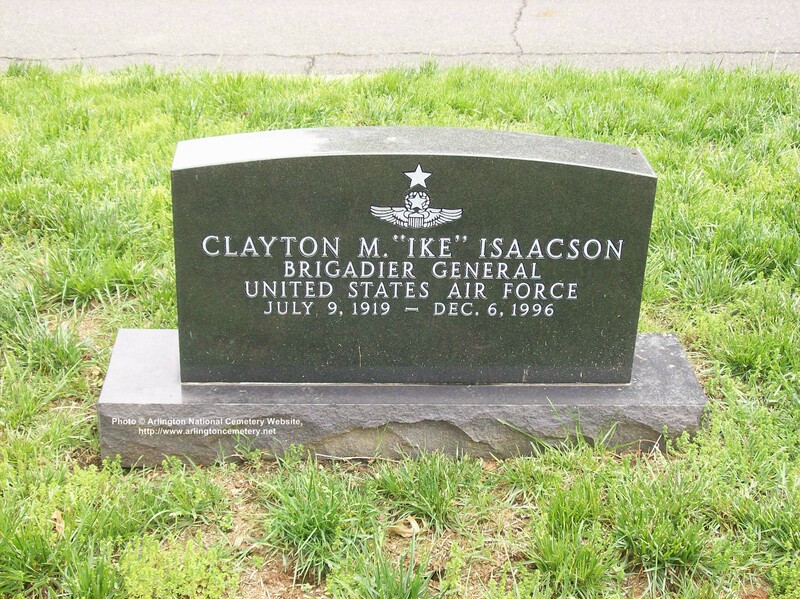 General Isaccson was buried with full military honors in Arlington National Cemetery.